[Lambeth Palace] Anglican churches are “deeply involved” in reconciliation work in conflict zones around the world, the Archbishop of Canterbury has said. 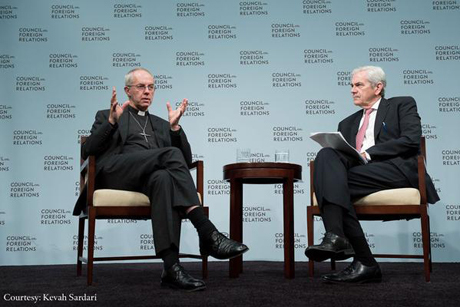 Speaking at the Council on Foreign Relations in Washington [yesterday, Tuesday 13 October], Archbishop Justin Welby said more than half of Anglican provinces are facing persecution or are in post-conflict or actual conflict. The Archbishop also said the mainstreams of all faiths must “challenge and subvert” radicalisation and religiously-motived violence within their traditions. Later the same day the Archbishop preached at Virginia Theological Seminary where he spoke of the need for a united church focused on Jesus that serves the weakest and poorest amid their suffering. Reflecting on his visits to every Anglican province during his first 18 months in office, the Archbishop said a “striking” common feature was Anglican involvement in reconciliation and meditation work. On taking office in 2013 the Archbishop announced that reconciliation – within and beyond the church – would be a key priority for his ministry. The Archbishop said that over the last 10 years there has been “a development in all the major global faith traditions of a stream within them of radicalised violence. I don’t know why this is happening but I think it bears significant research. Why is that so many faith traditions are seeing a radicalisation of small but significant proportion of their adherents? Asked about the challenges facing such a diverse Communion in the 21st century, the Archbishop highlighted the way that technology has intensified global awareness of diversity. “If you have a modern mobile phone, you have the entire world in your hand… through [social media], through news feeds, through blogs… it’s all there. But there’s no personal relationship. So you have diversity coming at you [at an] unprecedented rate. “In the 19th century, when the divisions in the Anglican Communion were certainly as complicated as they are now, but they took several months to get to you by ship – now they come at you in microseconds, and yet you don’t have the personal face-to-face contact which enables you, in the way that diplomacy, through prayer, through interaction at a human level, through facing… to deal with that diversity. The Archbishop said this challenge was not unique to the Anglican Communion but was typical of business, diplomacy and many other areas. He said there are two ways to tackle this problem. “First of all we have to build structures that enable us to trust each other, and not to be drawn into conflict by our structures within any global institutions – and that’s a massive challenge. You can watch the hour-long interview here. Next → Next post: Phil Groves at CCEA – What do I know?